The route provides 4.5km of two-way segregated cycle lanes along the A34 between the City Centre and Heathfield Road, Birchfield. The route is highly visible with a blue aggregate surface used to make it stand out to all road users. 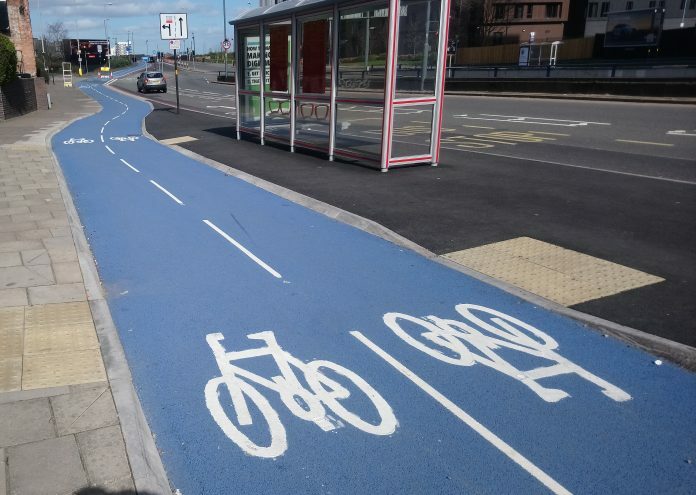 It provides a 4.5km two-way segregated cycle route between the city centre and Heathfield Road, Birchfield. The route is highly visible with a blue aggregate surface used to make it stand out to all road users. Councillor Waseem Zaffar, Cabinet Member for Transport and Environment at Birmingham City Council, said: “The completion of this cycle route is a key milestone in the development of cycle infrastructure in Birmingham and will enable cyclists to use this section of the A34 while completely segregated from other traffic, creating a safer and also more enjoyable cycling experience – and I speak from personal experience here as I live close to this route, which runs alongside my ward, and I use it myself when cycling. Driver awareness is particularly important and motorists are being advised of the need to heed the road markings which give cyclists priority over motorists. West Midlands Police Road Harm Reduction Team is supporting the city council by ensuring motorists comply with the layout of this new cycle infrastructure. They have already been patrolling the route before it opened, handing out driver awareness leaflets to motorists and advising them of the changes to some of the priorities on the route, and will continue to do so now the route is open. Motorists caught ignoring the new cycle route and road markings can be prosecuted. The A34 segregated cycle route is just one element of a much bigger programme of upgraded and new infrastructure delivered across the city over the last five years as part of the Birmingham Cycle Revolution programme. This includes more than 50km of canal towpaths improved with an all-weather cycling surface and more than 25km of new or upgraded green routes through parks and open spaces. Another segregated cycle route along the A38 Bristol Road is due to be completed next month, and an event to celebrate all the cycling infrastructure delivered through Birmingham Cycle Revolution is being planned for June. A series of engagement events and activities to promote cycle infrastructure delivered as part of the Birmingham Cycle Revolution programme is planned for this summer. For more information visit: https://www.birmingham.gov.uk/cycling.